Take Time to Rest — drift design co.
Aloha Friends! I'm back on the mainland and ready to conquer the world after my much needed time off, AND I have an awesome giveaway to tell you about, so keep on reading! Ryan and I decided a few years back that when we got out of debt from student loans we would save up for a trip to Hawaii. Finally, the time came and we were able to go for a full two weeks! One of the biggest reasons we knew we needed to take some serious time off is because both Ryan and myself are workaholics and never make time for ourselves. We knew that flying several thousands of miles away and planting ourselves on an island would force us to rest and slow the heck down. One thing we learned from our trip was that we really need to start scheduling in rest time. We realized how important it is to take the time to make the time to relax and rest. I personally am a planner and love writing To-Do lists, so I have decided that from now on I am writing "rest" on my To-Do list and making sure I get to cross it off! And speaking of time, for Ryan's birthday I was able to get him a JORD wooden watch. The lucky guy's birthday happened while we were in Hawaii so I was able to gift it to him there. Ryan loves anything wooden and he also loves his watches so he was thrilled when he opened it up. What's more exciting is that it could be your birthday too! I have partnered with JORD and am doing an awesome giveaway for your chance to win a $100 gift code to use on the JORD site! One lucky person will win, but everyone will receive a consolation worth $25 once the contest ends! Not only do they have awesome wooden watches for men, they also have several styles for ladies and I sure have my eye on a couple! All you have to do is click HERE and fill out the simple form and hit "Submit Entry" and Voila! The giveaway will close 03/12/2017 at 11:59pm so make sure to enter it now! I absolutely love this watch. It's made very well and looks so sharp and the packaging is perfect! I definitely recommend this and cannot wait till I can get myself one! May you all have a blessed day and I encourage you to take a serious vacation so you can feel refreshed and recharged! 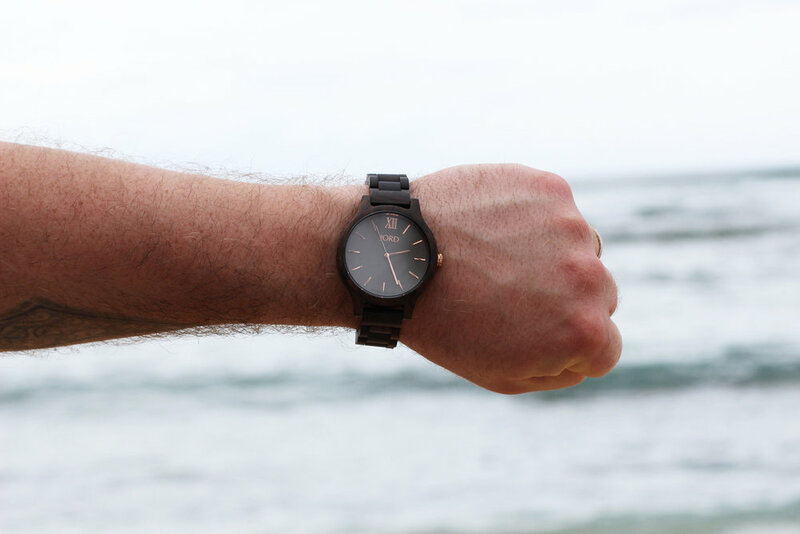 Who knows, maybe you'll be the lucky winner and can sport this watch on your tan arms (okay, maybe sunburnt arms) lying on the beach, drinking a coconut, and playing the ukulele!